BJ lives in Kansas City. She graduated from K-State with a bachelor’s degree in Business Administration with a major in Accounting, and works at Beauty Brands as the Controller. Hours donated weekly: 18-20 hours, primarily on the weekends and Wednesday evenings to take care of the animals. How I got started: I first visited Cedar Cove in August 2001.The day I heard about it, I made plans to visit. My heart was touched when I walked into the quaint little courtyard and saw seven breathtakingly beautiful tigers and three cougars. I was given a tour by Cedar Cove Founder William Pottorff and Shelly Tooley, and a passion that was buried deep within me began to come alive. I could see Billy and Shelly could more help, and I felt as if I were being given the opportunity of a lifetime. I worked under the direction and leadership of William and Shelly for many years, learning how to take care of these animals and how to stay safe. 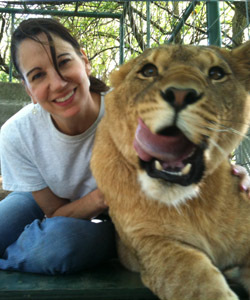 I also have attended two Big Cat Husbandry classes offered by the Feline Conservation Federation. I now have 10 years of experience, and a library of reference books. I also keep up to date on the current conservation efforts through many different organizations. Favorite(s): I am head over heels in love with Raja! He picked me when he was just a two-month-old cub. Something scared him and he ran to me and found a “safe haven,” and he seems to be forever grateful and trustful of me. Goal: I am passionate about educating people, especially children, on the situation of these animals in the wild. I want to make sure that each and every visitor at Cedar Cove leaves with a little more knowledge about these animals and about their place in the world. Cammy comes from Overland Park, Kansas, has been a Marketing Analyst and Buyer at Rockhurst University Continuing Education Center, Inc., for more than 20 years. How I got started: On my first visit to Cedar Cove, I remember walking through the doors leading to the sanctuary, and I was instantly transported to a different world. A world that made my daily trials and tribulations seem insignificant. The first animals I saw were the tigers. I was amazed at their beauty, grace, and size! As I moved through the park, I became captivated by every animal and every sound. I knew this was a world I wanted to be a part of. I started volunteering the following Saturday and have been there for three years. Favorite(s): The animal I am most attached to is Sierra, a female Siberian tiger. She was the first tiger to trust me and allow me into her world. She has taught me patience, perseverance, and determination. Sometimes when I’m standing on the outside of her enclosure saying her name and making a chuffing sound (friendly greeting), she will approach me and rub her head and body along her enclosure bars–wanting me to scratch her back and neck. She has captured my heart! Goal: The animals trust in us, depending on us to be there, regardless of weather conditions. 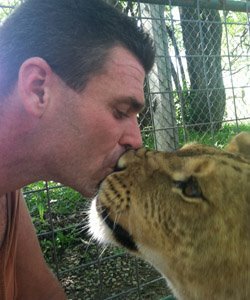 They are the ambassadors of the park and for exotic felines in the wild. We have the privilege to tell their story and educate the public about their plight in the wild. I educate myself about the animals and species from a wide variety of sources and media. I reading books, magazines, and articles. Watching videos and programming on cable (e.g., Animal Planet, Discovery, National Geographic/Wild, History). I also do a lot of research on the Internet and subscribe to newsletters from wildlife organizations, conservation organizations, endangered species programs, etc. Steve lives in Kansas City, Missouri, and has a BA in Journalism from the University of Kansas. He is also the Owner and President of his own design company: Steve Klein Design, Inc. Hours donated weekly: 30-40 hours every Tuesday, Thursday, Saturday, Sunday and as needed. How I got started: I first heard of a ‘tiger park’ near Kansas City in 2001 from a good friend, and my first visit with William, Shelly, and the animals captivated and called me to join my efforts to the care and cause of these amazing creatures. Having taken up a few construction projects and then working under the guidance and instruction of William and Shelly, I became more attached not just to the animals, but also the park itself and what it stood for. The sense of fulfillment I received from caring for these beings made me decide to focus my creative and engineering energies on building the park into the world-class facility we all envision. Favorite(s): I love each of these animals deeply and try to give them as much individual attention as my time will allow, but that being said...the lions Tonka and Shanta are a pair that I’ve been fortunate enough to bond with on a level I’d never allowed with the others and the absolute sense of pride (pun intended) I feel from their acceptance and affection is difficult to explain. Having a 200-pound lioness draped over you and grooming your head or hearing Tonka call out at the sound of my car arriving and running up to greet me is some of the best therapy for any kind of stress. Goal: Cedar Cove represents a long string of goals to me and I delight in looking back to see just how many we HAVE accomplished. However, my visions are grand and there is much more work ahead. Primarily, I want to improve the habitats and modernize facilities at the park to provide the best possible enclosures for the animals while minimizing the work required for chores, maintenance and repairs. In addition, I have a strong drive to expand our educational outreach, making us a valuable conservation and educational resource for schools, universities, and organizations throughout the region, providing information and experiences unique to our conservatory. Finally, I envision Cedar Cove reaching out to the global community, helping to spearhead conservation efforts on multiple fronts, including helping to establish a genetic repository of animal records to help clarify and classify the animals remaining in the wild and in captivity to improve breeding efforts and maintain pure species gene pools in the hopes of future habitat re-population.